Structural damage to the foundation is one of the biggest problems a home or building can face, especially when the foundation has dropped or settled significantly. 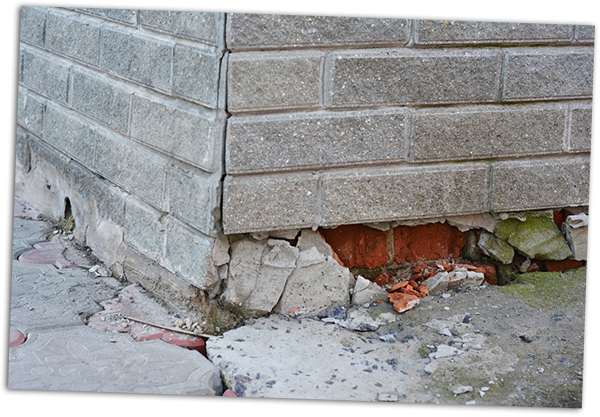 A shifting foundation not only damages the foundation walls, but also causes cracks and stuck doors and windows in the above ground structure. Most importantly, it destabilizes the entire home or building and places it in jeopardy of collapse. Toledo Basement Repair works closely with registered professional engineers. We determine which steel piering system is best suited for each project. We have several choices available, depending on your structure’s foundation design and the underlying soil composition. 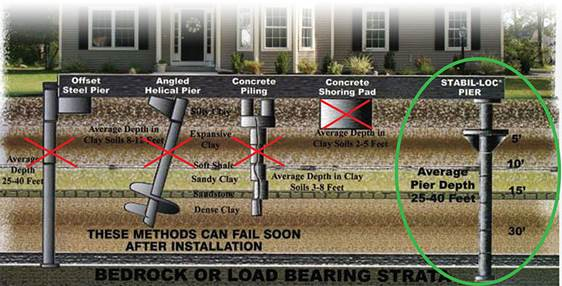 Either the push pier or helical pier system will be offered as a solution to your foundation problems. Learn a little more about each of these systems below. When all or a part of a foundation drops it can be repaired permanently and effectively with a system of steel hydraulic push piers. The structure is raised back to level with hydraulics. It is then supported by the piers sitting on a load-bearing layer of rock underground. Our in-house perfect pier system, unlike older pier systems using concrete in various forms, penetrates more deeply into the earth. This ensures a stable base and allows for a more precise raising and leveling of the building. Toledo Basement Repair uses a variety of CHANCE® Helical Piles, Anchors, and Accessories based on the project and application. CHANCE® termination devices coupled with CHANCE® helical piles are used to reinforce footing or stem walls. This is accomplished by spacing them apart depending on the load of the structure and bearing strength of the soil. For exterior remediation, underpinning brackets support the load of the structure. It also transfers that to the anchoring system. When interior remediation is required, CHANCE® interior slab bracket is a preferred solution. After most foundation stabilization projects, windows and doors that were stuck will once again work normally. Cracks in the walls will become repairable and furniture will sit level again. Our foundation repair team uses engineering data and the latest technology to ensure that each foundation we repair is done right, on time, and cost-effectively – and stays that way. If your foundation is in trouble, please contact us for a consultation.